When Mehmed II conquered Constantinople in 1453 AD, he made it the capital of the Ottoman Empire. He took for himself the title of “Kayser-i-Rum” – Caesar of Rome, or Roman Emperor. It was impossible to think of the Roman Empire as being ended. So the Ottoman sultans thought of themselves as continuing the power of the Roman Emperors, in their own capital at Constantinople. As the Altaic people pushed further south out of Central Asia, the Ottoman rulers were forced to extend their empire in other directions – mainly south and west. At first they thought they would reconquer the land of the old Roman Empire. By 1464 the Ottomans conquered the Marinids (in what is now Morocco). And by 1517, the Ottomans defeated the Mamluks to gain control of Egypt too. 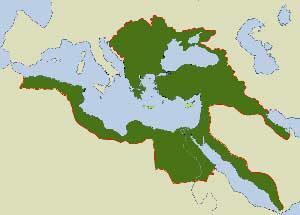 The Ottoman Empire also ruled all of south-eastern Europe, as far north as southern Poland. In 1529 AD, under the rule of Suleiman the Magnificent, the Ottomans besieged the city of Vienna in the Habsburg Empire. But in the end Ferdinand, Charles V‘s brother, managed to fight them off. Still, by the time Suleiman died in 1566, the Ottomans controlled most of the Mediterranean Sea, and most of Eastern Europe. That was most of the old Roman Empire. A treaty divided West Asia between the Ottomans and the Safavid empire. Suleiman ruled side by side with his wife, Hurrem Sultan, and many other Ottoman women ruled after Suleiman died. 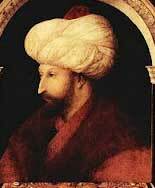 Suleiman’s son Selim II succeeded him, but Selim’s Vizier controlled the real power. 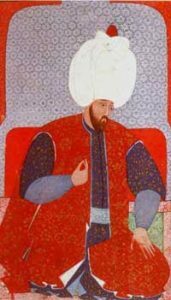 Selim’s son Murad II was equally powerless; his mother Nurbanu (probably originally from Venice) ruled through him for nine years starting in 1574 while he played games (Nurbanu may have gotten the idea from her neighbor, the Mughal queen Hamida Banu). In that same year, Nurbanu conquered the Hafsids (modern Tunisia). Nurbanu and Queen Elizabeth of England talked about an alliance against Spain, but Nurbanu died before the alliance would have been useful. She also negotiated with Catherine de’ Medici, who was ruling France as regent for her sons. Nurbanu took advantage of a Safavid civil war to reconquer a lot of Iraq from the Safavids. Nurbanu died in 1583, and Murad’s wife Sofia Baffo, another Venetian, succeeded to power. Cite this page: Carr, K.E. Suleiman the Magnificent – Ottoman history. Quatr.us Study Guides, September 11, 2017. Web. April 18, 2019.